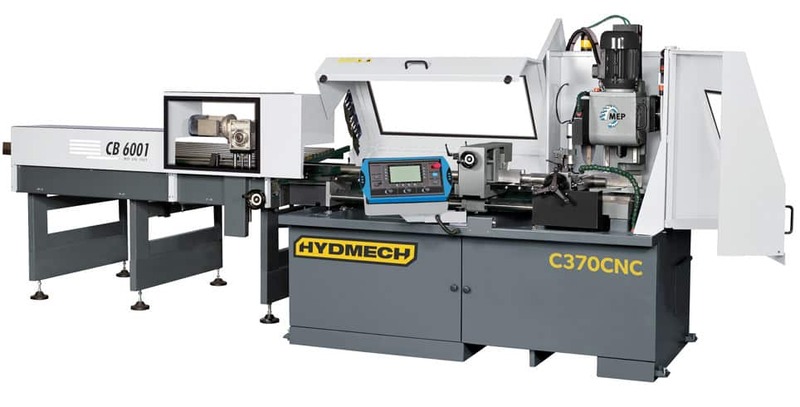 The HYDMECH C370CNC Metal Cold Saw is a fully automatic vertical circular saw with several unique features. It has the ability to extend carbide blade life due to its high volume flood coolant system which not only cools the blade, but also the material during cutting operations. 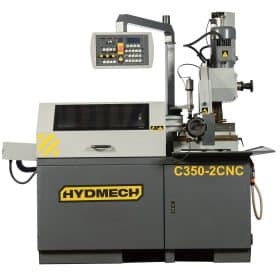 The HYDMECH C370CNC metal cold saw is an automatic vertical column cold saw which has mitering capabilities from 45 degrees right to 60 degrees left. The steel cold saw also has a normal 40’’ single stroke and a multi-indexing material feed system. The C370CNC also features a 4 3/4’’ round hollow capacity at 90 degrees, ahs a 7.5 HP motor and a 14 1/2’’ blade which makes this metal cold saw the model for quick, accurate and clean metal cutting. 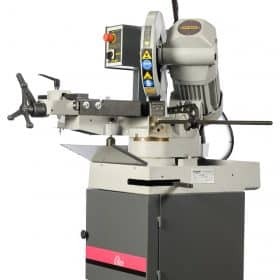 Has a heavy duty gearbox which enables 3 stage transmission motor and that is directly coupled to the saw head so as to ensure high precision and rigidity so as to reach high chip removal rates. It has a sawing head that rides on dual precision linear guides. Its sawing head movement is controlled by electro mechanic cylinder which has a diagnostic feedback and an automatic adjustment. Has microprocessor control which programs up to 32 different jobs, each varying in lengths and quantities. Has a multi-indexing shuttle feed which has a 40’’ single stroke and is driven by servo motor with a ball screw. Has a shuttle feed carriage that incorporates side movement to help one feed and center the deformed parts. Has pneumatic operating vertical vise so as to cut more than one part at a time. 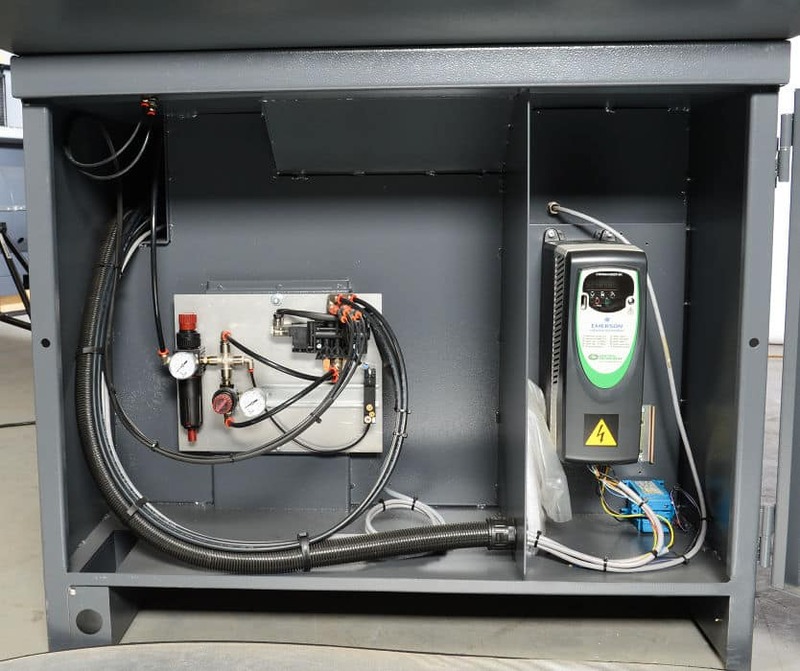 Has an enclosed steel base that has a removal chip drawer and a coolant tank. Has an ergonomically positioned control panel, which includes an emergency, a programming console, a digital display for machine diagnostics alongside cutting parameters such as cut time, blade speed and cut quantity. Blade rotation is complete together with an inverter variable speed drive that ranges from 15 to 150 RPM’s which enables it to obtain the best cutting efficiency. Has a wire chip brush for blade cleaning. Has a short remnant feature. Has a second pneumatic horizontal operating vise. Has an automatic chip conveyor. Has 370 mm cold saw blades. Has a BL6001 automatic incline loading table. Fabtech Solution is a trusted dealer of HYDMECH Band Saws, our service department regularly repairs and maintains wood and metal cutting bandsaw machinery. We carry complete lines of replacement blades, aftermarket parts and blade coolant. A large selection of bi-metal, grit and carbide tipped bandsaw blades as well as Fluid and Drip Lubricants. We can ship and deliver to your shop. Our Service Department will keep your saw in motion. We've included several resources and troubleshooting guides below. This material is for reference purposes only; please contact our Service Department with any questions or concerns. Contact our Service Department today with any questions. What type of hydraulic oil is used on HYDMECH machines? Texaco Rando HD46 or equivalent or machines built with Parker or Bosch Rexroth Power Packs use Shell Tellus 22 or equivalent hydraulic oil. The fill level is marked as a black line on the temperature / level gauge. What hydraulic oil filter is used on HYDMECH saws and how often should it be changed? HYDMECH uses commercially available filters. When calling to order filters, please refer to the information listed on your current filter to obtain the proper dimensions as different sizes are used. Filters should be changed after the first 50 hours of operation and then every 500 working hours after that. My saw runs, but I have no hydraulic functions or any pressure showing on the system pressure gauge. Between the hydraulic pump and motor there is a bell housing containing a three-piece coupling. Inspect the coupling to see if one of the flanges has loosened and slid apart. If it is necessary to re-connect the coupling, use removable Loc-Tite on the set screws, or if the coupling is damaged, it will need to be replaced. With new saw installations, if there is no pressure showing on the system pressure gauge, it is likely that the phase wiring is backwards. Reverse any two of the three phase wires supplying power to the saw. On my inverter driven machine the blade shuts down and will not restart. 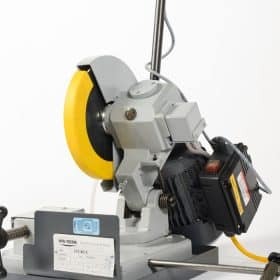 Disconnect the supply voltage to the saw for approximately five minutes. Turn the power back on and try to restart the saw blade. If the alarm or fault code persists, check the led screen on the blade motor inverter drive for the presence of an error code, call the factory with the saw serial number, inverter model number and the error code. My chip auger has stopped turning on my saw. The chip auger may be jammed with a thin piece of metal. If you are unable to locate or remove the obstruction, you need to reverse the auger rotation. Lower the head fully down, shut off the hydraulics, and reverse the two conveyor hoses at the hydraulic manifold. Start the hydraulics, raise the head, and switch the head to the down position and the chip conveyor will run in reverse dislodging the piece of metal. Then put the hoses back as they were initially. Enable and ready drive Ready to march. Phase motor short circuit Check the connection on driver and motor. Hi or low voltage supply Check the power supply voltage, transformer, connections. STILL LOOKING FOR WHAT YOU NEED? Our Service Engineers have the answers.